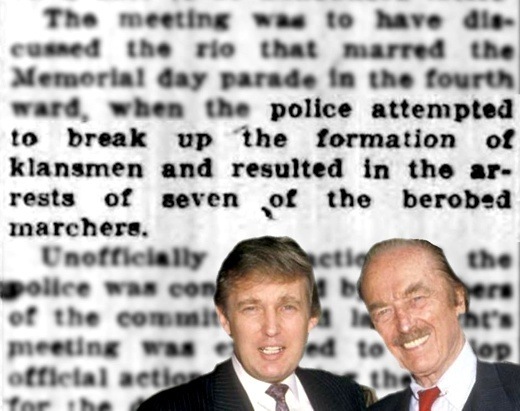 SUBHEAD: Reports confirm Donald Trump's dad was arrested at Klan rally, and that those arrested were "berobed"
Image above: Donald Trump and father Fred pictured together with report on arrest of Fred and other robed Ku Klux Klan members on Memorial Day 1927 in Queens NY. From original article. Fred Trump, the father of millionaire presidential candidate Donald Trump, was arrested at a Ku Klux Klan rally as a young man, according to a 1927 New York Times story. Vice put in the legwork on corroborating the nearly-century-old one-sentence report. They not only found other reports of his arrest, but the startling fact that those arrested were "berobed". The [Queens County Evening News] mentions Fred Trump as having been "discharged" and gives the Devonshire Road address, along with the names and addresses of the other six men who faced charges. Yet another account in another defunct local newspaper, the Richmond Hill Record, published on June 3, 1927, lists Fred Trump as one of the "Klan Arrests," and also lists the Devonshire Road address. Another article about the rally, published by the Long Island Daily Press on June 2, 1927, mentions that there were seven arrestees without listing names, and claims that all of the individuals arrested were wearing Klan attire. ... While the Long Island Daily Press doesn't mention Fred Trump specifically, the number of arrestees cited in the report is consistent with the other accounts of the rally. Significantly, the article refers to all of the arrestees as "berobed marchers." If Fred Trump, or another one of the attendees, wasn't dressed in a robe at the time, that may have been a reporting error worth correcting.